You can't ask for a better place for a party than Chuck E. Cheese's..."where a kid can be a kid!" Who is Chuck E. Cheese? He is the life size mouse that has the coolest house in the world! Not only is it a play area with video games that give you tickets and prizes, but there's good eats and jammin' music, too! The attraction for the little ones are the tubes and the Chuck E. Cheese band, Munch's Make Believe Band. There are some games designed especially for their age and the prizes that are available for what they earn are still cool. Who doesn't want a Chuck E. Cheese clapper? Even if they're too young to play the more advanced games, it seems they never get tired of watching the older kids show off their skills. For the little bit older group, the biggest draw is the arcade... and the pizza is the best. Tweens, and even teens, don't mind if they don't get the cool prizes... because the games designed for their ages are so much fun. The more expensive prize items are kind of "ticket pricey." You'll have to come often to build up enough tickets to earn one of the top prizes that would interest an older child or young adult. Although, even some of the cooler, older kids still will trade in tickets for a Chuck E. Cheese clapper... some things you just never get too old or too cool to enjoy! With a bit of practice, they manage to do pretty well and have a blast while they're playing. Don't let them know that they're working on improving their eye-hand coordination and motor skills. That sounds too much like school! As a parent it is comforting to know that "everyone who comes together, leaves together." As you enter, your hand or your forearm is stamped with a number that can only be seen under the light at the entrance/exit. Every group gets a different number. So if a predator does attempt to make a getaway with your child, he or she won't make it through the doors without being asked to show that their numbers match. Sitting back and relaxing while your children play is a little more plausible at Chuck E. Cheese's because of the care that has been taken to make sure the children are safe. All four of my children have had a party at Chuck E. Cheese. It is almost a rite of passage. The main mouse himself comes out and wishes you a happy birthday and sings the birthday song, along with the hostesses, and what could be cooler than that? Not only that, but you get free tokens on your birthday! That means more games without bugging mom or dad for extra quarters! 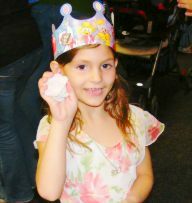 Everyone should get to be a birthday star at Chuck E. Cheese's at least once! You can book your party online after you decide which party package is right for your group. It may seem expensive, but buying pizza and all the decorations and fixings for a party at home is probably just as costly... and saving the wear and tear on parent's nerves is priceless. You can bring a cake or purchase one from them, they provide all the table settings and the pizza and drink, and you get the party table for 1 1/2 hours. Probably the best part is that there's absolutely no clean up after the party ends. Once the actual party is over it doesn't have to end! Stay and play for as long as your heart desires. 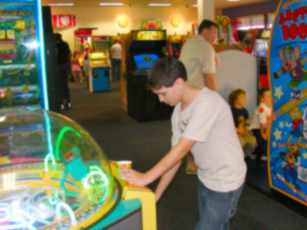 Because even grownups can't resist being a kid at Chuck E. Cheese's. 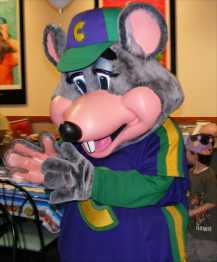 Chuck E. Cheese - Wikipedia - Complete history of this family restaurant.